Learn Pietro Boselli's workout and diet on FitnessGains.net. 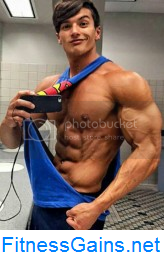 Follow Jeff Seid's tips for a successful fitness career on FitnessGains.net. Watch Daniel Roman's effective ab workout on FitnessGains.net. His winning double bicep pose and his muscular, sculpted physique are only some of his many fascinating characteristics. Jonathan Hayes is not your ordinary guy, he is a Thai-German mix, born and raised in Bangkok, Thailand. Jonathan came to the states a couple years ago to continue his pursuit in education and sports at the University of South Florida where he earned his Bachelors in Psychology. Jonathan hopes to one day publish books revolving around the topics of self-motivation and success. When he isn’t indulged in his writing, Jonathan loves to spend most of his spare time weightlifting and learning as much as he can about the subject in order to build a perfect physique. Not always being as fit as he is now, Jonathan hopes to one day teach and inspire the “underdog” of this generation and others to overcome. You find many high quality photos and videos of Jon Hayes here on AllAmericanGuys. Version 9 of AllAmericanGuys: See the new look, the new items, and the new models here on AAG.